This got me thinking about the materiality of votives. Most of the ancient examples that I work on are made from terracotta or bronze, but I have often wondered whether wax might also have been used to craft ex-votos in the Graeco-Roman world. We know, after all, that wax was used for (apparently cheap) figurines of gods. Juvenal (12.86-8), for instance, mentions ‘little images of shining crumbling wax’ in a lararium (household shrine) and Pliny the Younger (Letters 7.9.11) also refers to wax statuettes of the likes of Minerva and Mars. So wax was certainly considered a suitable medium for representing the divine. It was also associated with the dead. 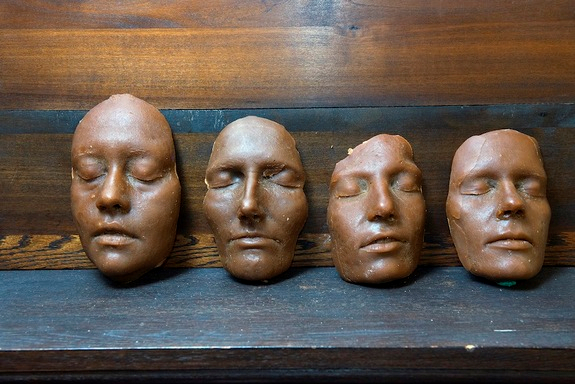 Veronique Dasen (2010, p. 116-117) has drawn attention to the use of wax for Roman funerary masks, noting its capacity to ‘imitate the transparent carnation of human flesh and its secret inner life’ as well as the fact that ancient authors sometimes suggest that wax portraits appeared to be ‘alive and breathing’. 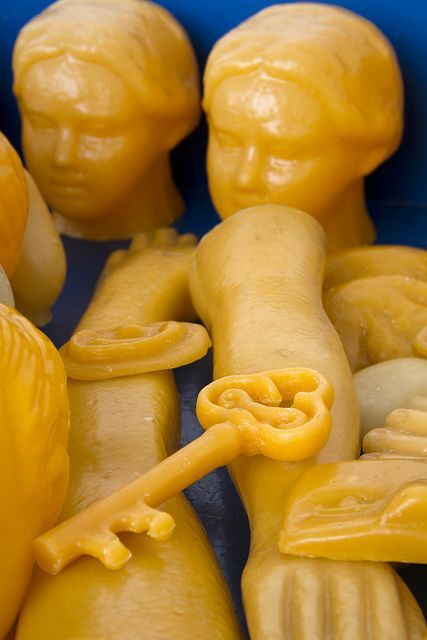 Wax, of course, is also a material that changes state and seems to sit between worlds – something that, in the ancient world at least, would be entirely suitable not only for funerary contexts but also rituals involving communications between the mortal and divine world. Nor was the medieval example of the wax ex-voto of Charles VI unique. Wax seems to have been used for this purpose quite widely from the 11th century, and especially during the 13th and 14th centuries, when, as Megan Holmes (2009, p. 161) notes, it was used, amongst other things, for anatomical offerings. The inventory of an ex-voto shop at Arezzo, dated to 1493, would not be out of place in the context of a 3rd century BC sanctuary in Italy, except for the fact that these objects were made of wax and not terracotta: ‘heads, eyes, teeth, chests, breast, arms, hands, legs, feet, hearts, swaddled babies … in large, small and medium sizes’. No wax votives (that I know of) survive from the ancient world. However, my own recent work on swaddled infant votives raises an intriguing possibility. Two terracotta ex-votos from Pianmiano at Bomarzo (3rd-2nd century BC) represent the bodies of an infant, swathed in smooth swaddling clothes but their faces are entirely absent. Instead, it appears that they were never inserted. The pieces are under-fired so it is possible that they were awaiting the addition of a (possibly custom-made) clay face. Nonetheless, the fact that they were found in the votive stipe, and not in a workshop, suggests that they had actually been used as offerings. So maybe the faces of these infants were once made of something else? Wax, as something impermanent and transitory in nature, would be an entirely appropriate material for a votive which may have been associated with an important transition in the life-course. Such an occasion lent itself to the use of a material which also lay betwixt and between states of being. We’ll probably never know for sure whether wax ex-votos were dedicated at ancient sanctuaries and shrines, but the evidence from medieval Europe, combined with what we know about the use of wax in other ancient contexts and the missing faces from Bomarzo, allows for some intriguing speculation. How different might our interpretations of votive deposits be if we consider that the durable terracotta and bronze items with which we are so familiar might once have been accompanied by as many, impermanent and eerily life-like, wax offerings? Dasen, V. (2010) ‘Wax and plaster memories. Children in elite and non-elite strategies,” in V. Dasen and T. Späth (eds) Children, Memory, and Family Identity in Roman Culture, Oxford, Oxford University Press, pp. 109-45. Megan Holmes (2009) ‘Ex-votos: materiality, memory and cult’ in M.W. Cole and R. Zorach (eds). The Idol in the Age of Art: Objects, Devotions and the Early Modern World, Aldershot, Ashgate, pp. 159-181.